Jailed Iranian human rights lawyer and women's rights activist Nasrin Sotoudeh is amongst the nominees of the Martin Ennals Award for 2012. Micheline Calmy-Rey former Swiss President and current Chair of the Martin Ennals Foundation announced the three nominees of the main international human rights movement award at a press conference in Geneva on April 24. Nasrin Sotoudeh, a prominent human rights lawyer and activist, is now serving a six year prison sentence in Evin Prison in Tehran. She has also been banned from practising law for ten years. Her sentence is specifically linked to her collaboration with the Defenders of Human Rights Centre (DHRC) in Iran which offered pro bono services in various cases, involving human rights violations. 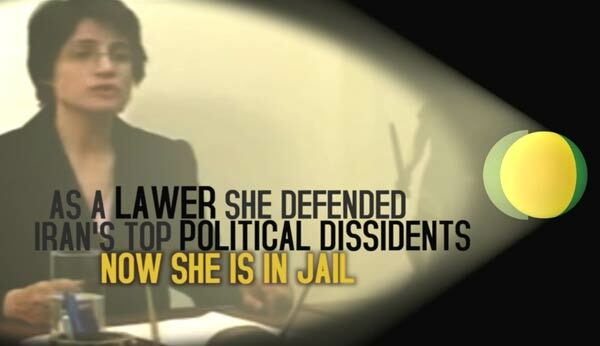 She is charged with "propaganda against the regime", "collusion and assembly with intent to act against national security' and "membership in an illegal organization (DHRC)." The Martin Ennals Foundation also introduced the other nominee as Venerable Luon Sovath, a Cambodian Buddhist monk who "uses videos, poems and songs to defend the right to housing" in his community in the face of threats, arrest and ongoing police intimidation. The third nominee is the Bahrain Centre for Human Rights which has been chosen for its work on documenting human rights abuses in Bahrain and advocating in support of demands for democratic change in the country despite government harassment and persecution. The Martin Ennals Award Jury includes ten human rights organizations: Amnesty International, Human Rights Watch, Human Rights First, the International Federation for Human Rights, the World Organisation Against Torture, Frontline, the International Commission of Jurists, German Diakonie, the International Service for Human Rights and HURIDOCS. The final winner of the MEA is to be announced on October 2, 2012 at their annual ceremony.